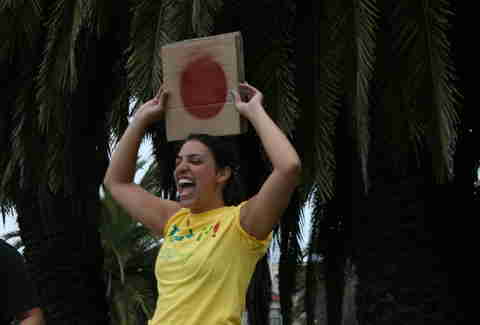 Recently, there was a giant Twister game and water fight at Dolores Park put on by these guys. And because we pride ourselves on our hard-hitting journalism, we sent an intrepid photographer to document exactly what it looks like when a bunch of people contort themselves on a huge, paint-filled game board while others shoot water at them. Obviously, things began with the traditional "massage a total strangers' shoulders" warm-up, as dictated by classic Twister rules. Then the game began in earnest. All of the circles were covered in paint, just to make things easier. Of course, there were some innocent bystanders... and some not-so-innocent bystanders, making things harder by using water guns to spray the players. We're pretty sure these are faces of joy. Pretty sure. 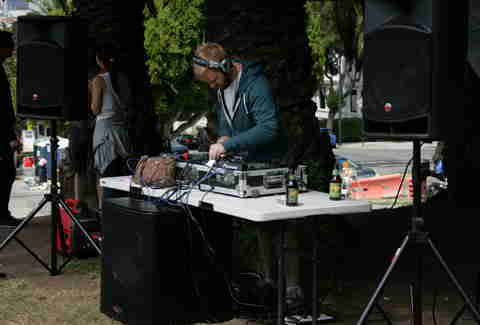 And of course, there was a DJ, who sadly did not play the Benny Hill theme on repeat. As it turns out, paint is very slippery. Not so much this one. Basically, though, this was amazing, and if they do this again, you should definitely put on some clothes you never intend to wear again, and get involved. 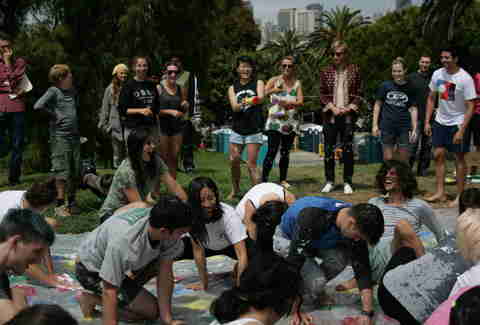 Joe Starkey is Thrillist's San Francisco Editor and is always up for paint Twister. Follow him on Twitter. Liz Iversen is a San Francisco-based writer and photographer. Massive Messy Twister is now on her bucket list.